It’s this time of year that I use momentum when it comes to my blog. If you look at past years December always has the least amount of posts. I am forcing myself right now to write this post because just like in the past I am finding it hard to motivate myself to blog. It’s not because I’m busy, but because my priorities change. One of these priorities is the amount of baking I do for birthdays! This month is full of birthdays. The people I tend to bake for have favorites and so have already been blogged, but it leaves me little room for other baking aka new things to blog! My father-in-law this year didn't have a preference so he left it up to me. 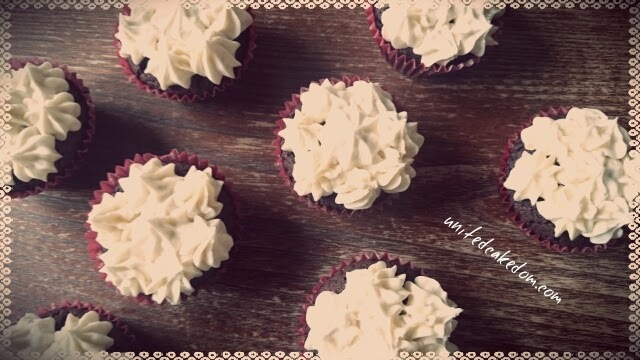 I choose to make him chocolate cupcakes, as I know he has a love for chocolate cake! 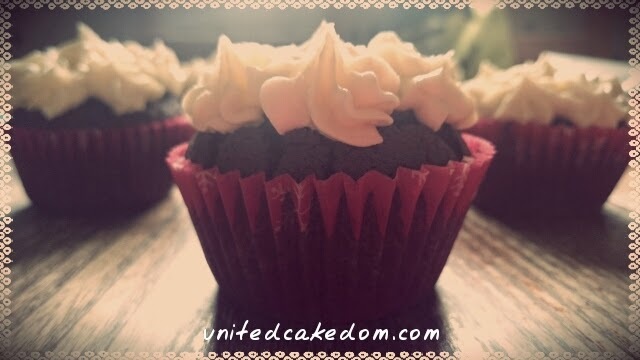 These particular cupcakes are a very soft crumbly cake with a kick of coffee flavor that enhances the chocolate flavor. The frosting is also one of the best frosting's I have made in a while; even if I messed up the Salted Caramel. It’s messed up because I didn't let the caramel caramelize enough. It starts looking a bit amber and I whipped it off the stove because I didn't want it to burn. I ended up with light lack luster caramel. It was still really tasty! The frosting had a nice vanilla/caramel taste that complimented the chocolate cake very well. Heat the oven fan to 170C. Melt the butter, chocolate, coffee granules, and water in a saucepan. Stirring occasionally until completely melted then take it off the heat. Mix the eggs, oil, and butter milk together in the bowl of a free standing mixer or large bowl. Gradually add the chocolate mixture to the egg mixture. Add both the flours, cocoa powder, bicarb, and sugar and beat until just combined. Using an ice cream scoop fill 24 paper cases in a cupcake pan about ¾ full and bake in the heated oven for 20 minutes or until the skewer test comes out clean. Cool the cupcakes before frosting them…. Beat the butter until it’s soft, light, and fluffy. Then add in half of the icing sugar and the salt, beat until combined before adding the rest of the icing sugar. Lastly add in about half of the salted caramel sauce and beat until well combined. 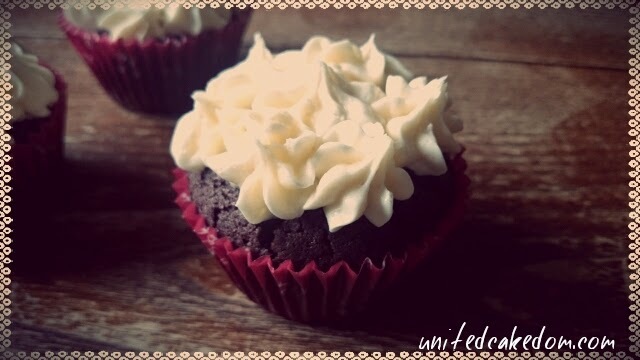 Fill a piping bag or just spread on top of each cupcake and enjoy! Or you could drizzle with some of the left over salted caramel or sprinkles or something. In a small saucepan heat the cream and vanilla together, don’t boil. While that is warming, place the sugar and water into a larger saucepan. Bring to a boil, once it’s started to boil give it at least 5 minutes or until it will be a deep amber color. It can burn quite quickly so keep an eye on it. (This is where I always seem to mess up, I always seem to take it off the heat too soon.) Once it’s ready take it off the heat and carefully add some of the vanilla cream. Whisk it quickly and keep adding the cream little by little until all combined. If it gets lumpy just whisk as fast as you can and if that fails place it back on a low heat whisking all the time. Once it’s cooled down add the salt. Save any leftovers in a clean/sterilized jar for up to 2 weeks in the fridge. It would be great on top of ice cream! 1. Am I the only one who is nervous about burning caramel? 2. What do you like for your birthday treat? I'd love to hear your answers below in the comment section! notes: The recipe is adapted from Jamie Oliver’s Food Tube The Cake Book by Cupcake Jemma. Next I will be making some birthday brownies for a co-worker so stay tuned! I love a good salted caramel frosting Lisa. These look delicious.